It's finished and I think it looks amazing! What's your opinion of the new Snaky Path mural? This is P7's legacy and we hope it will be enjoyed by our pupils, families, visitors and the local community for many years to come. We love the symbolism if the 'dove flying on and on' and the message of peace being passed from one child to the next. The artist also added extra detail to the start of the wall this week to represent all our pupils growing with us from Nursery age up to P7. Congratulations to all our pupils who celebrated the sacrament of Holy Communion on Saturday. 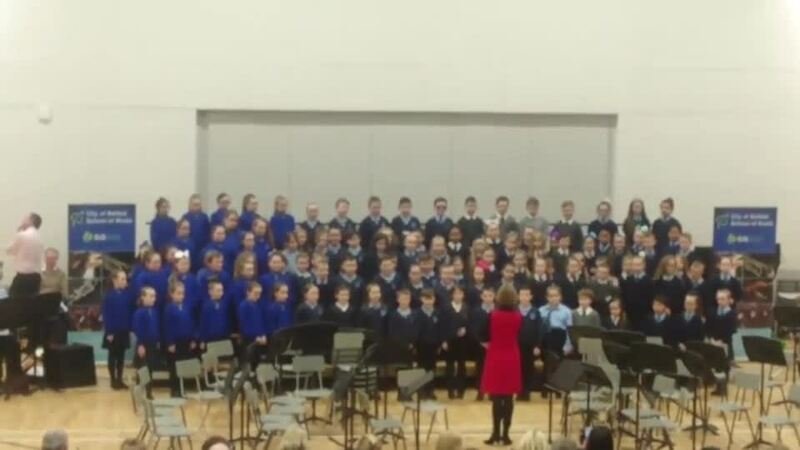 A big thank you to Mrs McGuiness for preparing the boys and girls for this special day, to Mrs Anderson and Mrs Acheson and the school choir for the lovely music and Father Cassidy for the beautiful service. Thanks also to our wonderful PTA team for decorating the hall to help us mark the occasion and Mrs Sowa for the delicious cake. On Tuesday 22nd May both our Primary 7 classes attended a STEM event at Belfast Castle run by The Belfast Hills Partnership. This was to help expand our pupils views of the world of STEM (Science, Technology, Engineering, Maths). This was a fun and energetic workshop providing lots of practical ideas and activities that the students could do at home and in the classroom. A very fun and informative time was had by both students and teachers. The five finalists from the engineering workshop previously held in our school went along to the Belfast Harbour Commissioners office on Thursday 8th March to take part in the finals of the engineering challenge. They were up against other primary and post primary schools in the region. The team were asked to build a structure which could hold 2 tins of beans using only 30 sheets of paper and 2metres of tape. The Hazelwood team were one of the only teams who successfully completed the challenge within the timescale given and were rewarded with a certificate and a chocolatey treat! Well done to our budding engineers! Some of the P7s at the road safety quiz in Mossely Mill. They did very well and are pictured here with the Lord Mayor Paul Hamill. A team of boys and girls from P6 and P7 were selected to take part in an athletics tournament at Jordanstown. They were involved in sprint races, hurdles, relays, standing long jump and the speed bounce. We did very well with Africa winning first prize for the standing long jump and Madison came second. the mixed agility relay team came second overall. One of our teachers Niamh McMillan has been nominated in the technology section of the Blackboard Awards. Good luck Miss McMillan. On Friday January 26th 2018, the Belfast Media Group will host the 6th Annual Blackboard Awards, recognising the quality of our schools, and awarding the best of our classroom assistants, principals and teachers. Teachers and principals who have been transforming lives will be celebrated in an upbeat event highlighting their hard work and accomplishments. The Belfast Media Group are seeking nominations from parents, schools and the community. The event will be marked by the publication of a special print and online supplement profiling our 2018 honourees. Since 2012 we have honoured teachers from a range of schools across Belfast, they included: Wellington College, Gaelscoil na Móna, St Dominics Grammar School, Orangefield PS, Braniel PS, St Mary’s CBGS, Methodist College, Knocknagoney Primary and Ashfield Boys’ High School. NICIE's Big Small stories exhibition at the Ulster Museum.